Wartime relations can cause a country to get down – as we saw in the United States during Vietnam – to a point where a large portion of the public doesn’t support the war. One of the ways countries, like the United States, curb this is by creating propaganda. In World War II, the United States ramped up the propaganda to get the public behind the war effort and to unite the country. The United States government’s efforts were a success, and the country saw a lot of growth following the war. This article looks at the types of propaganda used to help unite the war effort in the United States, during World War II. The United States government was not into the idea of propaganda at first. This was due in part to their propaganda efforts during World War I, which left a bad taste in the American public’s mouth. The U.S. adopted the “strategy of truth,” where they would release information, but not try and sway the public’s opinion regarding the war. It would take businesses and media pressuring the United States government into putting out campaigns, for it to actually happen. Even so, the government still viewed it as them simply giving out information, as opposed to propaganda. Agencies were created to help aid in the writing and distribution of propaganda. Two of the largest agencies involved were the Writers War Board and the United States Office of War Information. The Writers War Board handled the actual writing of propaganda and was made up of infamous American writers. The United Staes Office of War Information had one purpose: to deliver propaganda anywhere they could. This agency put out propaganda through Hollywood Studios, radio, and posters. The agency was a success but was dissolved following the end of war in September of 1945. The United States had propaganda in just about every aspect of media you could imagine, except for television. Though televisions have existed since the 1920s, they weren’t commonplace in households until the 1950s. Media types used included radio, posters, leaflets, comic books, books, movies, magazines, and newspapers. This poster was created for World War II, but didn’t become popular until after the war. Posters were widely used by the United States for propaganda during World War II, so much that there were over 200,000 poster designs created and printed during the war. The posters mostly had a positive message, which differed from other countries and they were designed by artists who were not compensated for their work. August 1943 edition of a comic featuring a cover of a war bond defeating world leaders. Comics were not an exception to American propaganda. 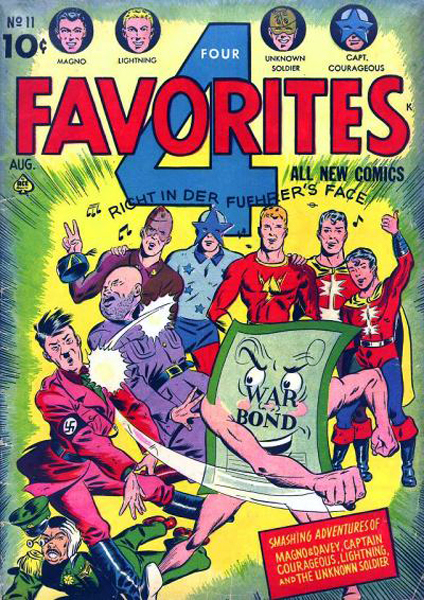 Many comics had common themes among them associated with the war effort whether that be the characters fighting Axis Powers or purchasing war bonds, production, etc. 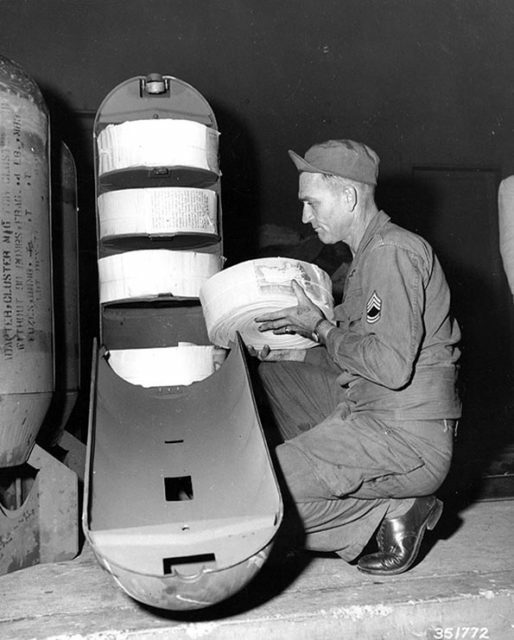 A leaflet bomb being loaded up with leaflets by a U.S. soldier during the Korean War. Leaflets were an important aspect of the spread of propaganda, as they could be used to reach those in rural areas. The leaflets would be dropped by planes over these areas, by the thousands. There was even a B-17 bomber group that was completely dedicated to the distribution of leaflets. The leaflets were also distributed to enemy troops, who could use them to surrender. But the main purpose of this was to display how powerful the United States was, due to the fact they could use planes for this sole purpose. Following the atomic bombings in August of 1945, the United States dropped pamphlets in Japan that suggested they were working on a more powerful bomb to be used if necessary. At first, movies were more neutral to the war than anything, not portraying any one party in any particular way. Following Pearl Harbor, this changed completely, and movies began favoring the Allied cause. Most movies produced during this time feature some sort of wartime aspect. They were either based on the war, or they were set in a war atmosphere. This was true even if the movie had nothing to do with warfare. 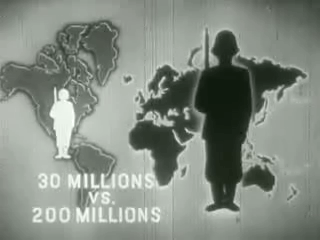 Screenshot of War Comes to America, one of the seven propaganda films produced in the series Why We Fight. The United States commissioned a series of seven films that were used for propaganda titled Why We Fight. 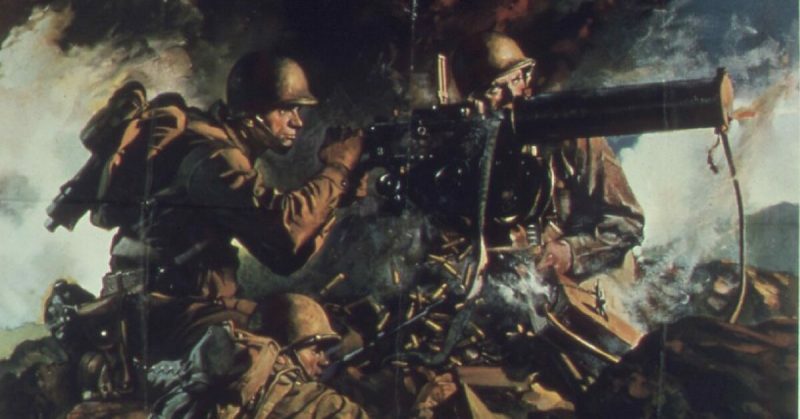 The films were used as a way to justify American soldiers fighting in the war as well as a way to get the U.S. public to support the war. The United States government was able to get the film released in theaters to the public. Radio was likely the most widely used form of propaganda during the war. Shows could be broadcasted all across the United States as well as the world, which helped broaden its reach. Popular shows during this time were President Roosevelt’s “Fireside Chat,” which was a radio show featuring the President. The show was created in the 1930s, but he did several of them during World War II. Other popular war-themed shows included This is War, which was broadcast around the world and Our Secret Weapon which was a show that listened to Axis broadcast signals and discussed the most entertaining lies of the week. No matter the propaganda, it had a main theme and an underlying theme. The main theme was always to support the war effort, the underlying theme could be anything from buy war bonds to something anti-German or anti-Japanese. The most popular types of propaganda were those asking for people to assist in the war effort. That could be anything from getting a factory job, to buying bonds, or converting goods. 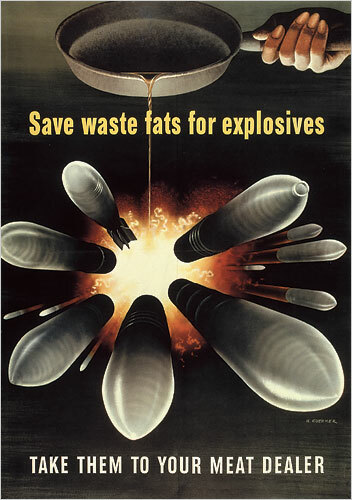 Posters were produced asking Americans to try and conserve products such as fats, butter, coffee, and rubber. 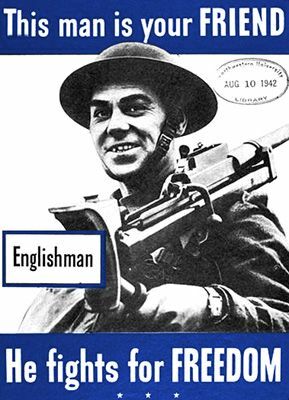 Conservation was the largest theme among posters produced during the war, as one in seven posters carried this theme. Their efforts were not a waste, as the United States was successful in recycling goods. One such example is the amount of paper that was recycled, 46 billion pounds. 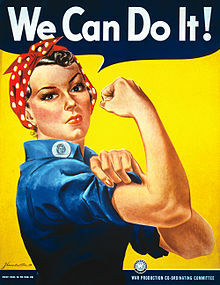 Other popular themes include victory gardens, which asked the public to plant gardens in the event of a vegetable shortage, as well as industry and production, pro-allies and women’s power (which aimed at getting women into the workforce). American propaganda advising viewers that the English are their friend and not the enemy. Propaganda was a very powerful tool for each country that used it during World War II. The United States was no exception to this, as it helped unite the public and the military in the fight to win the war.